Composer Boris Pigovat was openly excited to have his Requiem premiere in Kyiv. He said that, when writing it, he suffered a great personal tragedy and tried to express it in music. It took him a year and a half of Sisyphean labor. His parents and father’s sister had died at Babyn Yar on September 29, 1941. His composition is structured as a traditional Catholic Mass for the Dead, with a prayer recited four times a year according to the Judaic tradition. Thus the Holocaust Requiem conforms both to general European and Judaic religious traditions. Boris Pigovat was born in Odessa, graduated from Gnessine College of Music, and made aliya to Israel eleven years ago. His Requiem won him the Israeli Prime Minister’s Award. His compositions are performed in Australia, Hungary, Italy, Germany, US, and France. He met Roman Kofman by phone, discussing the score. Boris arrived in Kyiv some days ago and attended all the Ukrainian Philharmonic rehearsals. He praised the musicians highly. “It is very important that they accepted my music and treated it warmly. One sees this attitude listening to their rendition of the Requiem,” he said. German Ambassador Dietmar Stuedemann stressed, “Our soiree showed that we understand one another well, and such actions serve to build a solid cultural bridge spanning different nations. Music knows no frontiers, everybody understands it, and it has a tremendous emotional force.” The audience included representatives of many countries. After the concert people approached conductor Roman Kofman with words of gratitude, mostly saying that it was excellent and thanking him that they had been able to hear it. “The tragic theme is eternal in the arts and it is a powerful source of inspiration for composers, musicians, and painters,” says Roman Kofman. “I’m sure that the Holocaust Requiem has a great future. Boris Pigovat’s composition is very sophisticated, but it isn’t flowery or pretentious. It is simple but not primitive, it is frank and heartfelt, an outstanding work. All of us — the orchestra and viola soloist Reiner Mog — were co-authors. Reiner is a great musician, with many kudos, and I will just say that he played the viola with the Berlin Philharmonic Orchestra conducted by Herbert von Karajan, which says a lot. He is a subtle musician, very creative, and a true virtuoso. I think that he will keep the Requiem in his repertory, and that we’ll work together more than once. “I can well understand the audience’s interest in Isaac Schwartz’s Yellow Stars Symphony. The composer wrote it many years ago, but it was never performed in the Soviet Union. This evening saw its first rendition in Ukraine. The Schwartz style is easily recognizable, although he is mostly known as an excellent melody maker, author of the music for over 110 films and 35 plays. He has worked with such noted figures as Romm, Schweitzer, Kurosawa, Okudzhava, and Tovstonogov. He has an excellent academic background, he knows the orchestra and has a great melodic talent. His compositions are on altogether different plane. He speaks about the same topic in an altogether different language, very democratic, warm, and clear. 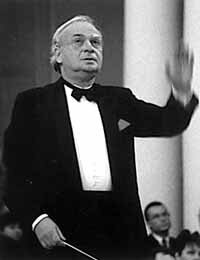 He wrote the concerto under the influence of the memoirs of a woman inmate of the Kaunas ghetto, a story about celebrating Purim with a noose around one’s neck. The concert organizers intended it also as a reminder that many composers were persecuted and their works remained unfinished because of their death or were undeservedly forgotten by posterity.